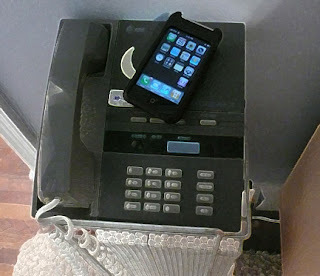 Saying that the iPhone replaces the old phone is not saying all that there is to be said. The iPhone is much more than a phone. It is an amazing piece of technology. . . a really cool little computer in your hand. It's better than anything I've ever had! It's a camera, a phone, the internet anywhere you wanna surf, it's Google – whatever, whenever, wherever and it's weather and maps if you're lost or just want to find a store in a city that you're visiting. It's also an iPod - music and video. It's all of this and more. Desktops - Old and New. The old Underwood is one I picked up some years ago for $25.00. It works, but what a chore just to get some of that old skool typewriter font on the paper. Much easier on the Mac! I just don't see how we functioned before Steve Jobs, Leonard Kleinrock, J.C.R. Licklider, Bob Kahn and Vint Cerf, and Radia Perlman came along and made life so fantastical! 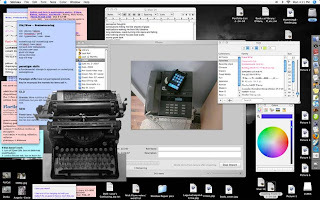 I love my iPhone, my iMac, my MacBook, and especially my old G3 Mac - still chuggin right along with it's old friends Epson Stylus Photo 1200 printer and UMAX Astra 2400S scanner. Music - Old Skool/New Skool. 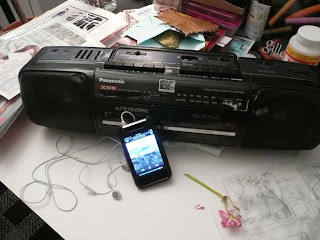 My old Panasonic Boom Box took me to school and to many an art class in the 90s. Couldn't have survived without it. It served me well, too at home. At night I would put a cassette in on the Auto Reverse side and let the thing put me to sleep. Many a night it played all night long. I've often wondered how many revolutions those little wheels inside actually made in those years of use. It still plays, but the auto reverse gave out. But, it's almost to the point that one can ask, "What is a cassette?" The iPhone's iPod fills all of my musical listening needs! And it's so small! Who knew. . . Loved reading this, very interesting about the i-phone, and great interpretation. I think we can conclude that old things are bigger, like those old mobile phones which were the size of a brick. I also had a typewriter like this one. I bet with the advent of the PC the sales of Tippex have gone out of the window. I have just seen an advert for a laptop which is so slim, barely there really, that you can put it in an envelope. Very nice interpretations, Gara! I especially like the last one with the iPhone/iPod versus boom box. What a contrast and excellent way to show how technology has advanced in the last 20 years! Well done. This is a walk down memory lane. Cool iPhone. I remember my first cell phone and it's ginormous size. I all but needed a messenger bag to take it along. Who could forget typing class on them ribbon typewriters and the old monochromatic green screens. Remember where we came from, and imagine where this will all lead.